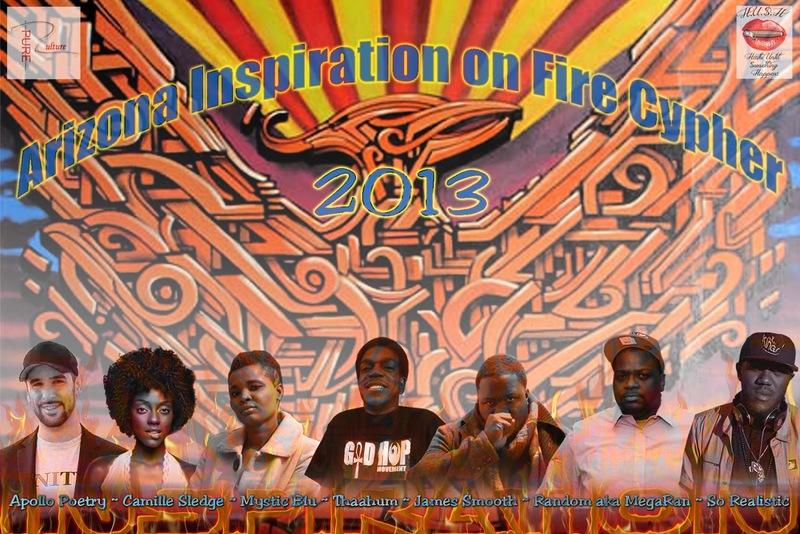 The 2013 Arizona Inpiration on Fire Cypher, the brainchild of Arizona artist Thaahum, is the first all conscious cypher the state has seen. It features seven artists from different parts of Arizona rhyming over a banging J Dilla track. The cypher is co sponsored by Arizona clothing companies Pure Culture and by DMack's H.U.$.H. Lyfestyle Clothing (http://hushlyfestyles.com). There will be a video for the cypher which is directed by @NegroTarantino of TXN Productions who's work was recently featured in the 2013 Phoenix Comicon. The cypher track also has remixes by Arizona DJ's Big Serg and DJ Trademark, as well as Rhode Island's resident DJ, DJ Head Honcho. The video will be released in June 2013.